Tri-Arc's Walk-Thru Fixed Steel Ladders are ideal for access to the roof, mezzanine or loading dock. 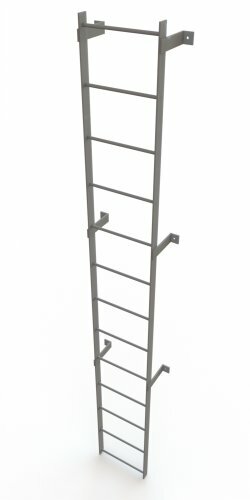 This 18-inch wide ladder with powder coat gray finish has side rails constructed from 2-1/2-inch x 3/8-inch flat bar, solid round 3/4-inch slip-resistant rungs, and 12-inch spacing between the rungs. 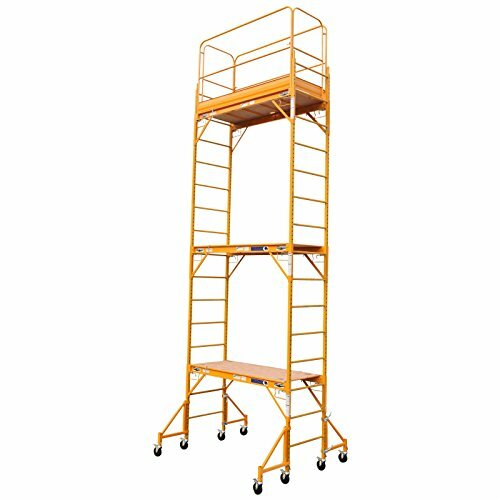 With a height of 9-feet from top to bottom rung and guardrails that extend 42-inches above landing surface, this model also ships fully assembled. Tri-Arc’s Fixed Steel Ladders are engineered and manufactured in compliance with OSHA 1910.29 and ANSI A14.7 standards and made in the USA. Tri-Arc's Standard Fixed Steel Ladders are ideal for access to the roof, mezzanine or loading dock. 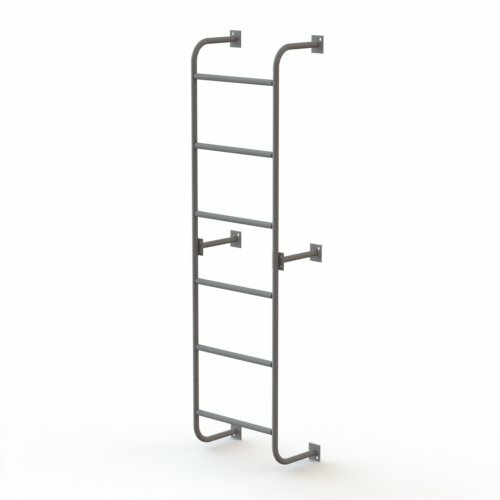 This 18-inch wide ladder with powder coat gray finish has side rails constructed from 2-1/2-inch x 3/8-inch flat bar, solid round 3/4-inch slip-resistant rungs, and 12-inch spacing between the rungs. 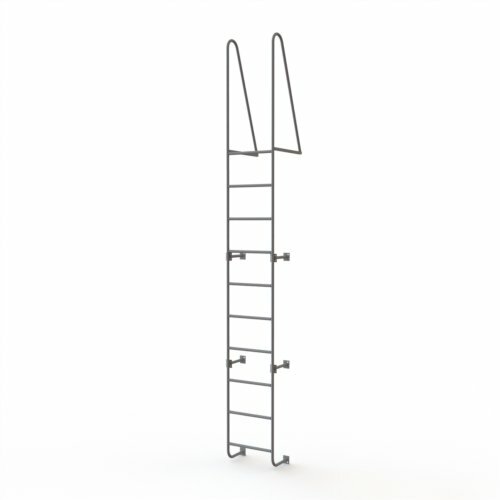 With a height of 12-feet from top to bottom rung, this ladder also ships fully assembled. Tri-Arc’s Fixed Steel Ladders are engineered and manufactured in compliance with OSHA 1910.29 and ANSI A14.7 standards and made in the USA. Tri-Arc's Walk-Thru Fixed Steel Ladders are ideal for access to the roof, mezzanine or loading dock. This 18-inch wide ladder with powder coat gray finish has side rails constructed from 2-1/2-inch x 3/8-inch flat bar, solid round 3/4-inch slip-resistant rungs, and 12-inch spacing between the rungs. 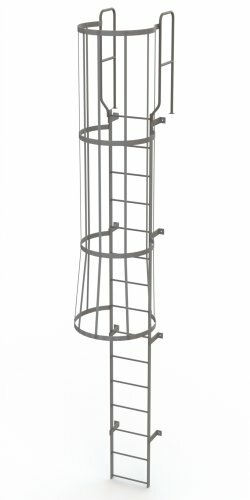 With a height of 14-feet from top to bottom rung, safety cage with flared bottom opening for easy entry, and guardrails that extend 42-inches above landing surface, this ladder also ships fully assembled. Tri-Arc’s Fixed Steel Ladders are engineered and manufactured in compliance with OSHA 1910.29 and ANSI A14.7 standards and made in the USA. Tri-Arc's Standard Fixed Steel Ladders are ideal for access to the roof, mezzanine or loading dock. This 18-inch wide ladder with powder coat gray finish has side rails constructed from 2-1/2-inch x 3/8-inch flat bar, solid round 3/4-inch slip-resistant rungs, and 12-inch spacing between the rungs. Safety cage is designed with flared bottom opening for easy entry. 24-feet from top to bottom rung. Tri-Arc’s Fixed Steel Ladders are engineered and manufactured in compliance with OSHA 1910.29 and ANSI A14.7 standards and made in the USA. Tri-Arc's Dock Ladders allow easy transition from street to dock level. Dock ladders mount to docking bays for personnel access to street level. 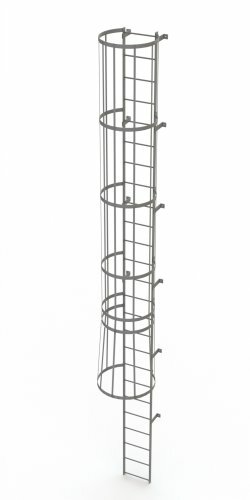 Made from 1-1/16-inch tube steel with a powder coat gray finish. Ladder is 18-inch wide with 12-inch spacing between the rungs. Tri-Arc’s Dock Ladders are engineered and manufactured in compliance with OSHA 1910.29 and ANSI A14.7 standards and made in the USA. Overall height: 72-inch. 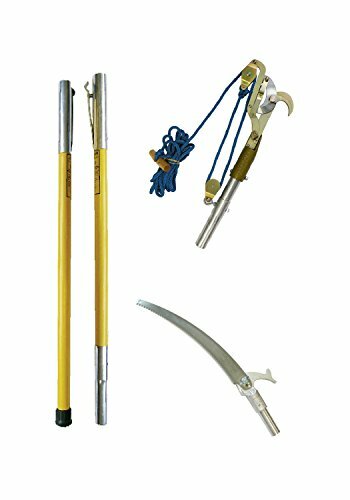 This tree trimming kit includes everything you need to get the job done in one convenient package. The Big Mouth double-pulley pruner offers the largest cutting capacity on the market at 1-3/4 inches. The Barracuda Tri-Cut saw blade features impulse-hardened teeth and comes with a pole adapter to easily switch from saw to pruner. The FG Series fiberglass poles offer a strong yet lightweight solution without sacrificing control or bending strength. Two poles are included for a maximum 12-foot reach. For highest performance and safety, Jameson recommends always using a base pole. Tri-Arc's Dock Ladders allow easy transition from street to dock level. Dock ladders mount to docking bays for personnel access to street level. Made from 1-1/16-inch tube steel with a powder coat gray finish. Ladder is 18-inch wide with 12-inch spacing between the rungs and 42-inch guardrails. Tri-Arc’s Dock Ladders are engineered and manufactured in compliance with OSHA 1910.29 and ANSI A14.7 standards and made in the USA. Overall height: 156-inch, Top rung height: 114-inch. 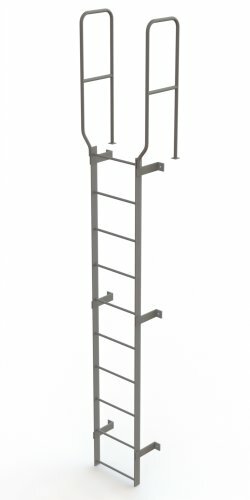 Compare prices on Osha Fixed Ladders at LiveSaler.com – use promo codes and coupons for best offers and deals. We work hard to get you amazing deals and collect all avail hot offers online and represent it in one place for the customers. Now our visitors can leverage benefits of big brands and heavy discounts available for that day and for famous brands. We try to makes comparison shopping easy with Product Reviews, Merchant Ratings, Deal Alerts & Coupons. Find Deals, Compare Prices, Read Reviews & Save Money.